About 60 percent of Taglit participants subsequently enroll in Masa programs, almost all of them in preparation for aliyah, Ms. Landberg stated. In response to a question about the most popular Masa programs, Ms. Landberg said that these include a Beersheba-based program in computer science and photography, a medical science course, a Beitar program in Jerusalem (which includes an ulpan, Jewish history course, and volunteer opportunities), and a sports program. Local participants were very sensitive to co-payment requirements, Ms. Landberg noted, and find certain Masa programs effectively closed to them because of mandatory fees. The writer met with a group of approximately 20 local students and other young adults who were participating in a training course to become JAFI madrichim (youth leaders). They readily answered questions posed by the writer. Their fields of university studies or work include engineering, architecture, radio electronics, psychology, teaching, and law. All of them had attended JAFI summer camps. (One girl said she had participated in various JAFI programs over a period of nine years.) Half of them had already been on a Taglit trip to Israel, and the rest said that they wanted to go on a Taglit trip in the near future. Some of the students said that they have relatives in Israel. None had yet participated in a Masa program, but several were exploring various Masa possibilities; the architecture student wanted to enroll in the Masa architecture pro-gram, but it is too expensive for her and, thus, she is considering other Masa options. Some of the JAFI Kharkiv madrichim candidates are seen at left. George Faingold, husband of the director of the JAFI office in Kharkiv, is at far left. Asked why they had enrolled in the madrichim course, a young man said that he wanted to be part of the Jewish community, and a young woman responded that she wanted to learn leadership skills. A peer leader of the group said that the various JAFI programs prove that a person can be Jewish without going to a synagogue, a comment that elicited general agreement from many of the other young people. In response to a question concerning possible parental objection to their participation in JAFI activities, all of them said that their parents were aware of their involvement in the Jewish Agency and approved of it; a young man added that even his non-Jewish father endorsed his JAFI activism. Several other participants indicated that they also are offspring of mixed marriages in which the non-Jewish parent supports JAFI involvement. Because a large number of the participants had indicated interest in future aliyah, the writer asked the males if they would willingly serve in the Israel Defense Force; the young men responded affirmatively, one individual stating that the IDF was the only army in the world in which he would serve. The writer also met with 15 parents who were attending a briefing about the Na’aleh (high school in Israel) examinations that their 14- or 15-year old children would soon take. In response to questions, the parents said that they believed that their children would have a better future in Israel than in Ukraine; they were enrolling their teens in Na’aleh because completion of high school in Israel would help their offspring integrate into Israeli society. Some doubted the likelihood that their children would be admitted to a high-quality high school or university/college in Kharkiv; opportunities for a good education were stronger in Israel. Families had attended a three-day seminar in which Na’aleh – and a broad choice of specific Na’aleh programs - was fully explained to them, so they felt well-informed about the substance of Na’aleh and the opportunities it afforded their children. One-third of the parents said that they have relatives in Israel. It is likely that they will join their children in Israel at a later time; the adults are remaining in Ukraine for now because their employment skills do not transfer well into the Israeli economy, they need to care for elderly parents who are too frail to go to Israel or do not want to leave Ukraine in their old age, or another reason. 41. The Israel Cultural Center, located in the same building as Kharkiv JAFI offices, is managed by the same team that manages the Israel Cultural Center in Dnipropetrovsk. The writer was unable to visit the Kharkiv center due to time constraints. 42. Oksana Galkevich, the Director of American Jewish Joint Distribution Committee operations in the Kharkiv region, was preoccupied with the forthcoming dedication of the Wohl Center, a new Jewish community center that was to be opened on March 29, one week after the writer’s visit to the city. Many international guests were expected for the event. 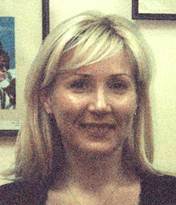 Oksana Galkevich directs JDC operations in Kharkiv and the surrounding area. The new Wohl building encompasses 3,700 square meters of space over two floors plus a half basement; it includes premises for both a Jewish community center and the hesed or welfare center. As is the case in other new large JDC Jewish community centers in St. Petersburg and Odesa, the Kharkiv facility is constructed around an atrium. The building includes an elevator and is fully wheelchair-accessible. Community center space features a 250-seat theater, two dance studios, an art studio with a kiln, a computer anima-tion studio, club rooms, and an up-scale daycare center designed to at-tract middle- and upper-class fami-lies. The atrium of the new Wohl Center is shown at left. No sports hall or swimming pool is included in the Wohl building. Premises have been set aside for commercial space, income from which is expected to support Jewish community center operations. Ms. Galkevich acknowledged that no tenants had yet been secured. She and her staff had been preoccupied with opening the building, she said, and had not yet really tried to find tenants. She acknowledged that JDC would need to find revenue-generating activities that would not “kill the Jewish element” in the Center. Ms. Galkevich stated that she is aware of the controversy engendered by the development of similar large JDC Jewish community centers in St. Petersburg and Odesa without community involvement and with insufficient financial support for construction or full operation. Neither facility has engaged the local Jewish population and each is underutilized. Steep user fees limit accessibility to the general Jewish public. Ms. Galkevich said that she trusts her staff and a volunteer corps to address these issues in Kharkiv. Responding to questions about the general economic situation in Kharkiv, Ms. Galke-vich said that economic conditions are worse today than they were two years previously, i.e., at the time of the writer’s most recent previous visit, and, she said, circumstances were likely to decline further. Inflation is severe; it affects the cost of utilities, petrol, transportation, food, and medicine. Clearly, each of these economic sectors is related to the others, she continued, noting that increased petrol costs generate increased transportation costs and thus affect the cost of food and other items transported from one place to another. Basic pensions are being paid on time, Ms. Galkevich declared, but welfare supplements for specific disabilities are in arrears. A new tax code, said Ms. Galkevich, is “killing” small businesses. 43. Replacing a failed Egyptian-theme restaurant, the Shalom kosher restaurant attracts both Jewish and non-Jewish customers. A private business, the owners found the Egyptian-theme decor too expensive to replace so diners consume kosher meals surrounded by images of pyramids and other symbols of Egypt and the Arab Middle East. 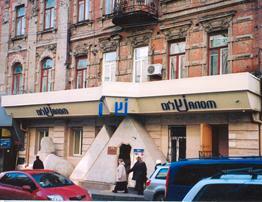 The Shalom kosher restaurant in Kharkiv is furnished in an Egyptian theme. Photo: the writer (in 2009). The tests, which are administered in the Russian language, not only measure a youngster’s academic readiness for studies in Israel, but also evaluate a young person’s psychological readiness to separate from his/her family, live in dormitory accommodations, and generally adapt to new surroundings. Suggested, but not explicitly stated, in some parental responses was that bribes were necessary to assure entrance to the better secondary schools and universities/colleges in Ukraine. The parents were unable/unwilling to make such payments. The naming gift was from The Maurice and Vivienne Wohl Philanthropic Foundation of Great Britain and was obtained through World Jewish Relief. Other funders included the American Jewish Joint Distribution Committee and the Conference on Jewish Material Claims against Germany. An earlier JDC-built Jewish community center was badly designed and badly located. Hesed operations had been located in a dilapidated older facility not fully accessible to many of its clients. The Wohl Center is close to several public transportation lines. See http://www.jta.org/news/article/2011/04/05/3086729/jcc-opens-in-kharkov-ukraine and Barry Toberman, “Ukrainian dream realised in presence of WJR backers,“ Jewish Chronicle (London), April 7, 2011.